I'm not an organized person. Organization just does not come easy to me. I literally need to label every single drawer, every single shelf, and every single and basket to keep myself organized in my classroom and at home. My first year of teaching I labeled my kiddos folders and expected them to just organize themselves. "Okay, let's get out our math folders," I'd call out, and ten minutes later would all finally have our math folders out. I swear that desks eat folders, pencils, and crayons at night. I really do. Because even though I was blamed for it a lot, I never, ever, ever creeped in their desk at night and messed things around so my kiddos couldn't find things. I knew something needed to change, so I did a STAR binder the next year, all their folders where in a binder and the binder went back and forth each day. 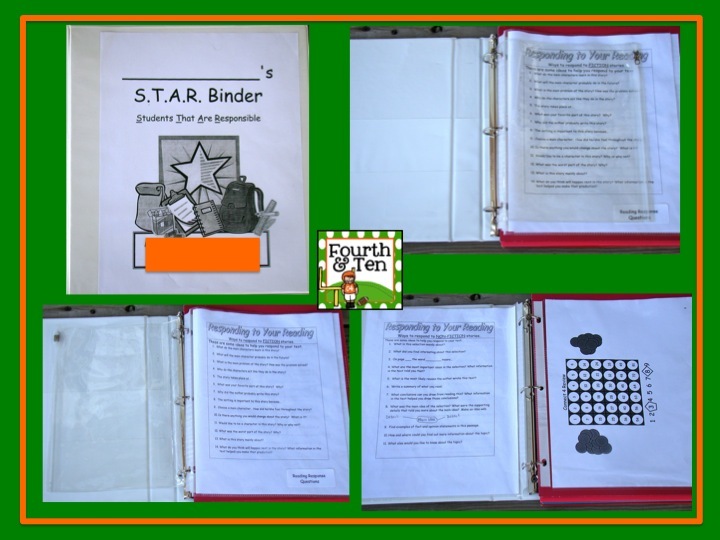 I got the idea from Mrs. Van Dyke, you can check out her informational page about STAR binders here. However, no matter how many times I begged, begged, and begged my parents that year to not empty their child's folders, they always did. Meaning daily little Susie and Tommy was missing the paper we started the day before because their momma cleaned out their binder's folders the night before. 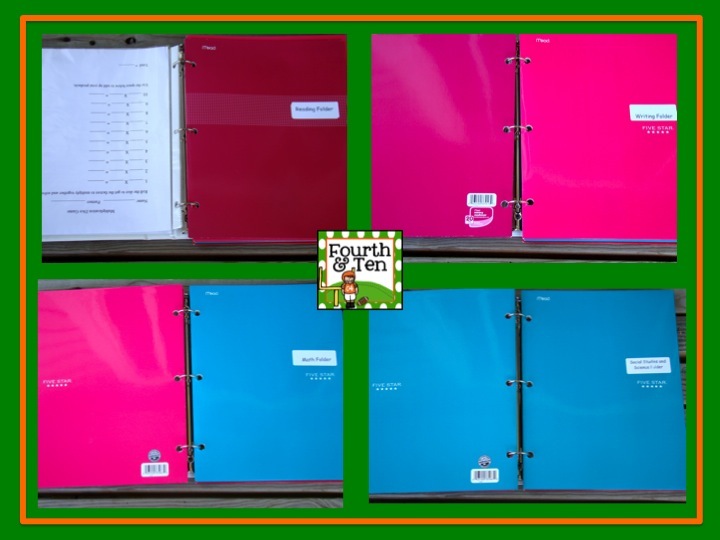 Although I liked the organization the binder provided, the trip back and forth to school really caused a lot of additional wear and tear on the binders and I always had a few darlings that forgot their binders at home almost daily. With the struggles of the first year of STAR binders in mind, I changed my binder up a bit to something that worked best for me. :) Our binder was still named STAR (Students That Are Responsible), only the binder stayed at school. I'm telling you friends, it makes such a difference having all of my students important papers all in one place in their desks. The cover for my STAR binder came from Mrs. Van Dyke, it's at the very bottom of this page. The zipper pouch held our classroom currency, and I kept their reading response questions for self selected reading in the clear sleeve in the front, as well as a clear sleeve for games we learned to play throughout the year. Having this math sleeve is great! When my students finished a math activity early, they would play game with a partner in their sleeve with a dry erase marker. My kiddos would also take their binders with them to small groups in reading and math, or for partner work. This worked great, because they could refer back to previously completed work on a topic. Each subject had a folder, along with a work folder, for random odds and ends that just didn't fit in a subject folder, that somehow was not included in this sample. We'd go through our folders about every two weeks and I'd list on the Smartboard what they needed to keep in their folders. Setting up the binders DOES take up a chunk of time at the beginning of the year, but it's so worth it! I've tried it many different ways, having parents assembling them at open house, putting them together as a whole class, and putting them together in small groups. I prefer putting them together in small groups. While the class is working on their time capsules and other beginning of the year getting to know you activities, I pull tables up one at a time and assemble the binders. It goes pretty quickly, if you involve your kiddos. I let them put their own labels on their folders, they won't look perfect but that's okay, and put every thing in their binders themselves. Using STAR binders made such a difference in my classroom, and they really helped keep my students organized. My kiddos desks were certainly neater too, and they felt like such big kids because of their binders. I changed schools/grade levels this past year a week before school started, and didn't do my STAR binders this year due to craziness that is packing and unpacking a classroom days before school starts. Let me tell you, I HATED not having them. My kiddos desks were so, so, so messy and I felt like we wasted so much time looking for the proper folder. I always had my students keep their folders in a certain order in the STAR binder and they were all labeled, so my kiddos certainly had "NO EXCUSES" for not having papers in the right place. The fourth grade team at my school already does organizational binders, so I'm so, so, so excited to be reunited with my beloved STAR binders again! :) Hooray! I really like this idea. I've heard of some teachers using the little dividers, but I like the folders idea, too. Do you think it could work with 2nd Graders? I'm so glad you posted this! I'm having the little nuggets use binders like this next year and it's so great to see how it's worked in other classrooms. Thanks again! I love the sound of the STAR binders! We have actually moved away from binders (although I loved them!) because we are using notebooks in all subjects area. Last year we did it only in Science and SS, but I think this year we are moving to having a notebook for each subject. We wil see how that goes! Great idea!! I am your newest follower! I would love to have you stop by my blog when you get a chance and check it out. Love the theme of your blog. I love this idea. I like having an entire class organizational system!! Wonderful. I hope to integrate this into my classroom as well! Just became your newest follower. I love this idea! I've seen it a few other places, but your description and the way it is organized really made me feel like it would be a great addition to my classroom! I love this idea so much, in fact, that I just wrote a post about it to link up to Fun in 4B's Fabulous Find Linky Party. My post links back to your blog. I hope this is alright with you. If it's not, let me know and I'll take it down! compatibility is utmost crucial prior to continuing with the actions. Aptoide iOS authenticate the availability of one more application store in it.